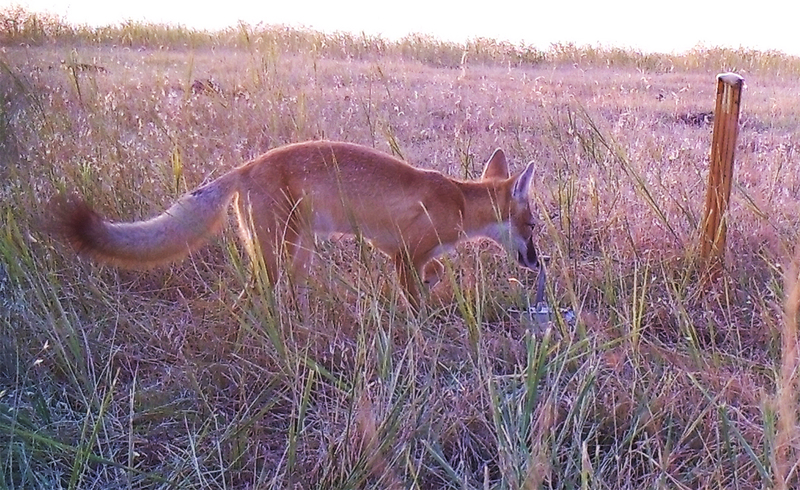 These images of the swift fox were captured as part of the Nebraska Canid Project, which identifies where the species lives to help inform its conservation in the state. It darts through the near-total darkness of a chilly night in the Nebraska Panhandle, drawn across the short-grass prairie by the wafting stench of a skunk. No larger than a house cat, it accelerates to 25 miles per hour, then gradually coasts within eyeshot of a stake capped by a glob of petroleum jelly. As the nocturnal sleuth approaches the skunk-scented lure, a camera mounted on a nearby fence registers the movement and heat. In a flash, the camera automatically snaps a three-photo burst of the elusive creature before it abruptly moves on to search for dinner. 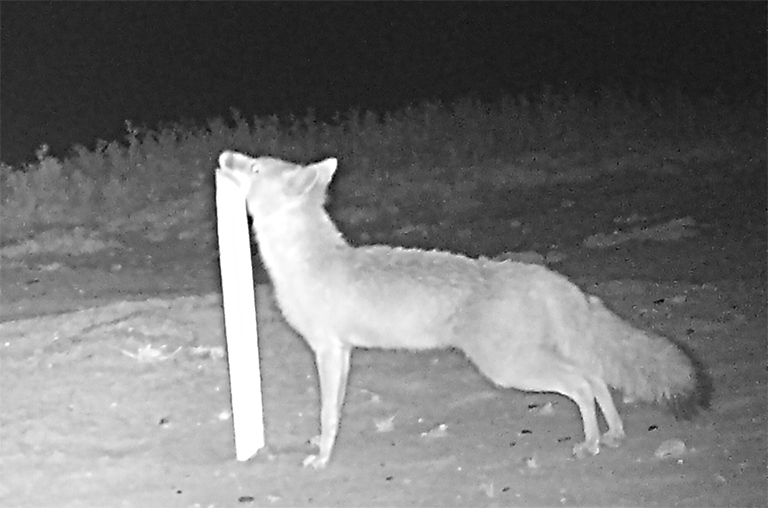 Two weeks later, the University of Nebraska-Lincoln undergraduate who planted the camera trap will sit down to a computer that reveals what she was hoping to find: images of the swift fox, once a common Great Plains predator now residing on Nebraska’s list of endangered species. The experience comes via a new one-credit course that is exposing undergrads to biological fieldwork while furthering a statewide conservation effort to map the distribution of the swift fox. The course is also examining how research experiences shape undergrad attitudes toward canids – the family of mammals comprising foxes and coyotes – and understanding of the complex interactions that resound throughout canid ecosystems. In 2012, the Nebraska Game and Parks Commission approached T.J. Fontaine for help determining which areas the swift fox still inhabits. That knowledge can inform decision-making – whether to follow through on the building of roads, for instance – that affects the prospect of swift fox survival in the Cornhusker State. And clarifying where the species no longer resides can offer clues about its decline while helping the Nebraska Department of Roads and other state agencies save significant time, effort and money. Fontaine, an assistant unit leader of the Nebraska Cooperative Fish and Wildlife Research Unit, worked with doctoral student Lucia Corral to develop a model that identified likely swift fox havens by accounting for factors such as landscape and food webs. Corral then began surveying sites throughout the western third of the state, recruiting the assistance of Chadron State College students in 2013. But the undertaking posed a challenge: Roughly 97 percent of the state’s territory is privately owned, requiring Corral to contact more than 450 landowners. The team got permission from about 130 of those landowners to survey for the swift fox, but Fontaine believed his team could do better. That’s when an idea formed: Why not expand the pool of undergrads surveying the state? Many in the School of Natural Resources at the University of Nebraska-Lincoln, he knew, had grown up in or among families whose farms and ranches might still house the swift fox. And with more than 25,000 square miles to survey, the team needed all the help it could get. So Fontaine, alongside the University of Nebraska-Lincoln’s Jenny Dauer and Chadron State’s Teresa Frink, submitted a grant proposal to the Nebraska Environmental Trust that allowed them to bring more undergrads into the fold. “This is Nebraska, and one thing I know about the state is (that many) people here are from Nebraska and proud of that fact,” Fontaine said. “They’re invested, and their families are invested, in Nebraska. It just made sense to work with them. At the same time, it’s giving them a new skill, a new way to think about things, a new approach. A cohort of 23 students from the University of Nebraska-Lincoln and 35 from Chadron State began surveying sites – many private, some public; many rural, some suburban – at the outset of the fall semester, after swift foxes had raised their young to independence and begun venturing beyond their dens. Many students have conducted reconnaissance with Google Earth to pinpoint ideal locations for their camera traps, which they retrieve after 10 days. 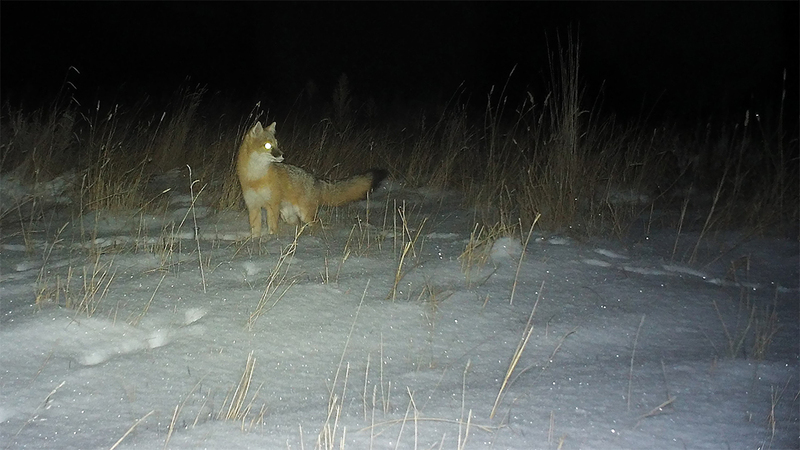 Though the swift fox remains the prized subject, Fontaine said many different animals of interest end up wandering through the camera traps: other fox species, coyotes, deer, jackrabbits, owls, bobcats, badgers, porcupines, pheasants and plenty more. Students later pore over the images after some training from research technician Claire Helmke, whose experience might help a student distinguish between a coyote and a red fox, for example. Those species classifications, and where they were found, then enter a database that is used to update a map of swift fox distribution. While the students attempt to document the swift fox, Dauer is documenting how the project might influence their views on canids in particular and predators in general. She said the swift fox – cute, small, often monogamous – is usually seen more favorably than the coyote, which will kill the former to eliminate competition for prey and other resources. Yet both are predators, serving similar functions in the context of an ecosystem. Dauer is curious whether learning about these parallels might close gaps in student perceptions of the seemingly disparate canids. She’s even more interested in getting students to consider how tweaking even a single variable in the complex equation of an ecosystem – the quantity or range of a species, the features of its landscape, the climate – can affect others. To start, Dauer introduced software that helped her students build box-and-arrow models containing all the factors they thought might alter the population size of the swift fox or other canids. She also tasked the class with making predictions about the consequences of changing those variables. The students are now testing their predictions by using the software to modify the value of a variable – say, the number of roads in an area – and discover how population size and other variables rise or fall in response. To put her students in the role of conservationist, Dauer will soon ask them to formulate management strategies and test those strategies within the models they created. One potential takeaway that Dauer hopes to witness: an appreciation for how fieldwork and theory combine to drive the scientific enterprise. To that end, the students will also be examining and considering image data collected throughout the semester. According to Fontaine, the project might benefit more than even the swift fox, the undergrads studying it, and the state agencies looking to either conserve or avoid encroaching on it. Eventually, he said, the team hopes to embark on what he called a “traveling road show” featuring the project’s most compelling photos and an overview of what participating communities have helped achieve. “We can show the communities: ‘This is the beauty of Nebraska. These photos were shot in your backyard.’ It’s a great opportunity to be able to do that,” Fontaine said.